The clan among the clans, he dwells in clan after clan. Given their parallels in Sanskrit, it is clear that this expanded system of āmreḍita -s was already present in the ancestral Indo-Iranian tradition. Here we briefly examine the āmreḍita-s in the Ṛgveda. Given the temporal position of the RV, it likely presents a picture of the usage of such compounds close to the beginning of the Indo-Iranian tradition. There can be anywhere between 1 to 4 āmreḍita-s in a given ṛk. The number of ṛks-s with each number of āmreḍita-s per ṛk is shown in Table 1. The maximum number of āmreḍita-s in the RV is four, which is seen in a single ṛk, the one given in the opening lines of this article. By far the most common āmreḍita is dive-dive (day after day), which occurs 47 times in the RV (the next most common, the ancient pra-pra, occurs only 12 times). A related usage ahar-ahaḥ meaning the same as dive-dive occurs 6 times. Thus, the āmreḍita used in the sense of ‘daily occurrence’ seems to be a characteristic feature of the Vedic language. Another temporal āmreḍita is yuge-yuge (6x), which famously occurs in later literature in the Bhagavadgītā. Whereas in that text it means ‘eon after eon’, in the RV it likely means some version of the pañcasaṃvatsara-yuga, which is explained by Lagadha in the Vedāñga Jyotiṣa. Some other temporal āmreḍita-s are also used on rare occasions in the RV: māsi-māsi (every month) and parvaṇā-parvaṇā (every fortnight). Other āmreḍita-s tell us about the old Āryan way of life and religion. Several of them indicate the sense ‘in every household’: dame-dame (6x), gṛhe-gṛhe/gṛhaṃ-gṛham (7x), vastor-vastoH (2x). Others denote the sense ‘in every clan’: viśe-viśe and variants (7x), jane-jane/janaṃ-janam/jāto-jātaḥ (5x). These meanings are shared with the most common Iranian āmreḍita-s, suggesting that they were significant for the Indo-Iranians at large. Specifically, these terms indicate that the households and the clans were the primary organizational units of society. There is no mention of towns or even villages in any āmreḍita-s although forests and trees are alluded to vane-vane/vṛkṣe-vṛkṣe. This is reflective of the semi-mobile life in the forest-steppe zone with its characteristic confederation of clans. As we have noted before, the people of the RV were a warlike people. Thus, the āmreḍita-s meaning something like ‘in every battle’ or ‘in every contest’ are common: bhare-bhare (6x), vāje-vāje (4x), raṇe-raṇe (2x). 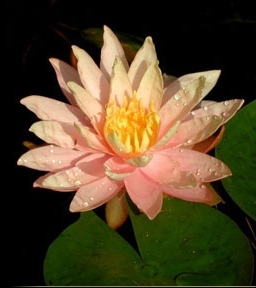 There is also a śatroḥ-śatroḥ, i.e. ‘of every enemy’. This indicates that frequent military encounters were a feature of the lives of the early Indo-Āryans. 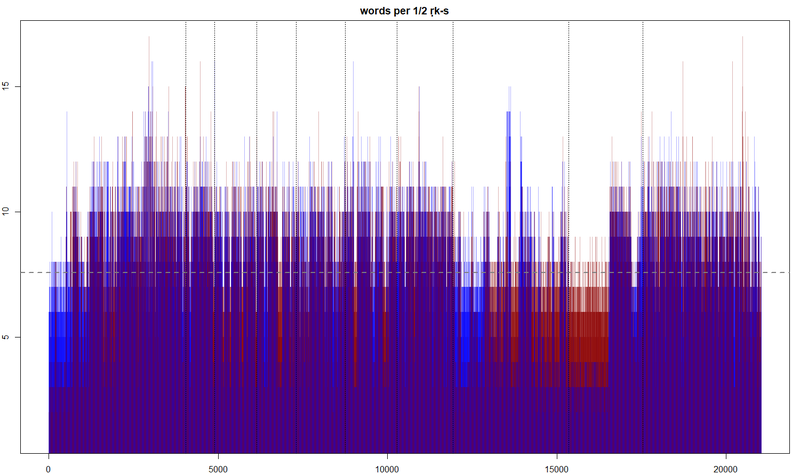 Figure 1 shows the number of words per hemistich (ardhark) with the alternate hemistichs colored in blue and red. The maṇḍala boundaries are marked with vertical dotted lines. This plot shows that the RV has a generally consistent average behavior across most maNDala-s keeping with the relatively tight repertoire of Chandas (meters) used by most clans. However, the anomalies are also immediately apparent. The maṇḍala-8 dominated by Kāṇva-s clearly stands out as having a distinct structure. Moreover, this pattern is also seen in the initial part of maṇḍala-1 where multiple Kāṇva-s are represented. Further, in maṇḍala-1 we see an anomalous spike corresponding to the ultra-long meter, the atyaṣṭi used by prince Parucchepa Daivodāsi. In maṇḍāla-9, the soma-maṇḍala we again see an anomaly. Here there is a strong separation of the short meters (gāyatrī-s) in the first part and the long meters closer to the end. This reflects this distinct aggregation history of the maṇḍala-9, which unlike the family books tends to collect the sūkta-s used in the soma ritual from different clans around a Kāśyapa core. These anomalies again come out clearly in the first two panels of Figure 2, which show the average number of words per hemistich and the average number of words per sūkta across the 10 maṇḍala-s. Figure 2 shows some of the statistics for the RV with relation to the āmreḍita distribution. These features are related in part to peculiarities discussed by in our earlier analysis of related issues pertaining to the RV. We observe that the maṇḍala-s 8 and 9 have the lowest average number of words per hemistich, keeping with the dominance of the shorter meters in these maṇḍala-s (panel 1). However, we can see that Kāṇva-s tend to compose long sūkta-s; hence, they figure a higher number of words per sūkta on an average (Panel 2). However, in contrast, maṇḍala-9, which also has the lower average number of words per sūkta, has no such compensation and is dominated by short sūkta-s. These are peculiar to the soma ritual and the sāman-s composed on them. We also note that the Atri-s and Vasiṣṭha-s tend to compose more short sūkta-s than the others. Barring these anomalies, the RV is quite uniform, especially in terms of the average number of words per hemistich. 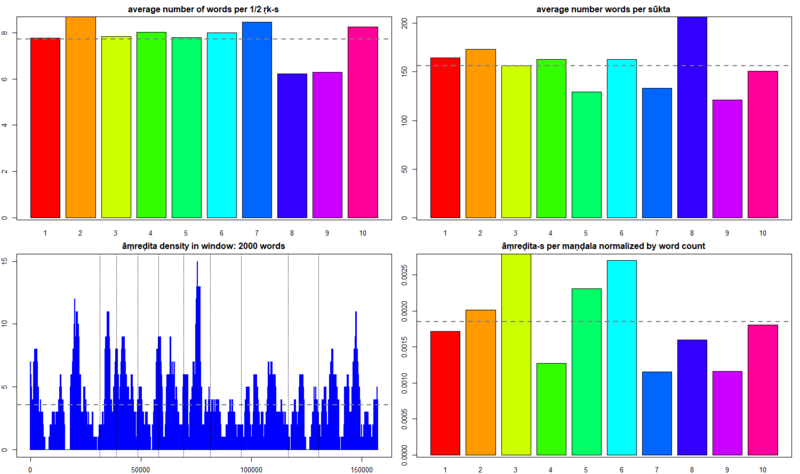 This gives us the general background to investigate the distribution of āmreḍita-s.
Panel 3 for Figure 2 shows the āmreḍita-s in a sliding window of 2000 words through the length of the RV. The maṇḍala boundaries are marked by a vertical dotted line. We observe that the āmreḍita-s are not uniformly distributed. There are whole regions with a low count and others with notable spikes. We find that the maṇḍala-s differ in their use of āmreḍita-s (Panel 4 of Figure 2): maṇḍala-s 3 and 6 of the Vaiśvāmitra-s and Bhāradvāja-s are rich in āmreḍita-s, whereas those of Vāmadeva, the Vāsiṣṭha-s and the soma maṇḍala are particularly poor. In the case of the soma maṇḍala, the metrical structure with a low average number of words per hemistich probably discriminates against āmreḍita-s. However, in the case of the other maṇḍala the difference in āmreḍita counts is in spite of their mostly average behavior in terms of word count per hemistich (compare panel 4 and panel 1). To understand if this difference might have any significance, we simulated the distribution of āmreḍita-s as a random process using the total number of āmreḍita-s in the RV (Table 2). 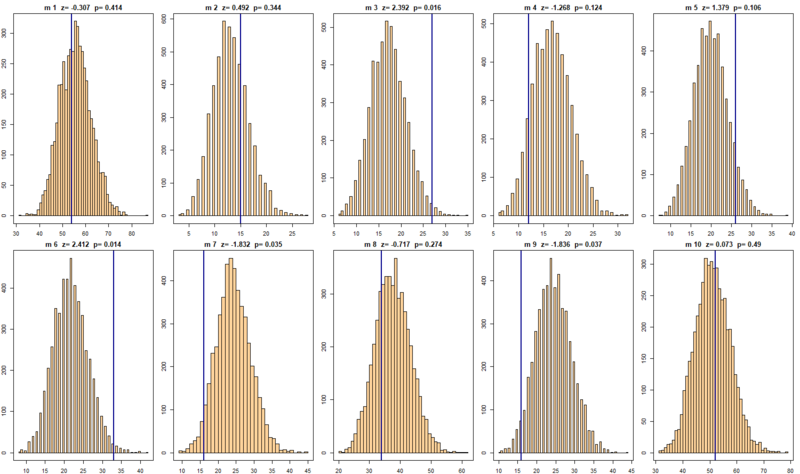 We created 10000 artificial sets corresponding to the size of each maṇḍala, checked the number āmreḍita-s reached in each replicate and computed the Z-scores for the observed number of āmreḍita-s and the probability of getting the observed number or more/less by chance alone (Figure 3). This experiment suggests that maṇḍala-s 1 and 10 have more or less the average number of āmreḍita-s one would expect by chance alone. This probably reflects their composite nature rather than being the product of one dominant clan. However, maṇḍala-s 3 and 6 have greater than expected number āmreḍita-s (p=0.016 and 0.014 respectively), whereas maṇḍala-s 7 and 9 have lower than expected number of āmreḍita-s (p=0.035 and 0.037 respectively). This observation suggests there was possibly a conscious difference in the poetic styles of the Vaiśvāmitra-s and Bhāradvāja#-s on one hand and the Vāsiṣṭha-s on the other, with the former showing a predilection for the use of āmreḍita-s. This makes one wonder if the reduced use of āmreḍita-s by the Vasiṣṭha-s, who had some links to the Iranian side, represents a regional tendency also seen in the Avesta, which also uses a low number of āmreḍita-s. As noted above the unique structure of the soma-maṇḍala probably accounts for its low āmreḍitacount. This entry was posted in Heathen thought, History and tagged grammar, Hindu, Hindu ritual, Hindus, Indo-Aryan, Indo-European, Indo-Iranian, Iranian, linguistics, mantra, religion, Rigveda, ritual, Veda, vedic. Bookmark the permalink.